NASA Mars mappers uncovered powerful evidence over the past couple of years that Mars was once covered with seas and lakes of water. Researchers combined measurements from instruments on orbiting NASA spaceprobes to plot the Red Planet’s terrain in detail. Their results point to the existence of a series of layers of sediment left by large areas of liquid water in a region called Hellas Planitia in Mars’s southern hemisphere. 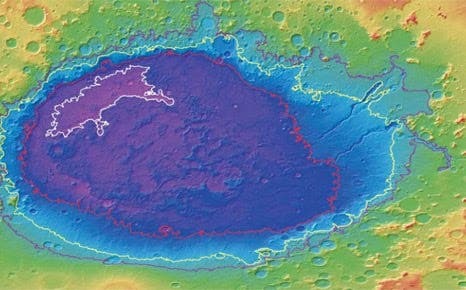 The Mars mapping project at the Tucson-based Planetary Science Institute concluded that the 2,000 km diameter and 8 km deep Hellas impact basin contains sediments laid down by an ancient sea that filled the body (image above). The investigators interpreted fine-layered outcrops around Hellas’s eastern rim as sedimentary deposits. They say they were produced by the erosion of rock in the highland regions which were then carried into a basin-wide body of water. Dr Leslie Bleamaster, of the Planetary Science Institute in Tucson, Arizona, said the lakes or seas existed between 4.5 and 3.5 billion years ago when conditions may have been more favorable for the existence of life, many scientists believe. The Hellas basin, more than 2,000 km wide and 8 km deep, was produced by a massive impact early in Mars’s history. It is the largest impact site on the planet. In planetary science, volatiles is the name given to water and chemical elements with a low boiling point that are found at a planet’s surface or in its atmosphere and crust. Evidence has previously been found for an ocean near the martian north pole. The NASA rovers Spirit and Opportunity have also found deposits at the surface that must have been left by water. Spirit’s tracks churned up bright silica. More recently, the Phoenix lander photographed water ice beneath the craft and in a trench it dug. Geophysicists at the University of California, Berkeley, have long refuted one of the key arguments against the past presence of large oceans on (image) Mars. In the 1980s, Viking spacecraft images revealed two possible ancient shorelines -Arabia and the younger Deuteronilus- which date from between 2 and 4 billion years ago near the pole, each thousands of kilometers long with features like those found in Earth's coastal regions. In the 1990s, however, NASA's Global Surveyor mapped the Martian topography to a resolution of 300 meters, and found that the shoreline varies in elevation by several kilometers (more than a mile), rising and falling like a wave with several thousand kilometers from one peak to the next. Because shoreline elevations on Earth, measured relative to sea level, are typically constant, many experts rejected the notion that once had oceans. UC Berkeley scientists discovered that these undulating Martian shorelines can be explained by the movement of Mars' spin axis, and thus its poles, by nearly 3,000 kilometers along the surface sometime within the past 2 or 3 billion years. Because spinning objects bulge at their equator, this so-called "true polar wander" could have caused shoreline elevation shifts similar to those on Mars. "When the spin axis moves relative to the surface, the surface deforms, and that is recorded in the shoreline," said Michael Manga, UC Berkeley professor of earth and planetary science. "On planets like and Earth that have an outer shell, or lithosphere, that behaves elastically, the solid surface will deform differently than the sea surface, creating a non-uniform change in the topography," added primary author Taylor Perron, a postdoctoral fellow in Harvard University's Department of Earth and Planetary Sciences. "This really confirms that there was an ocean on Mars," said Mark Richards, professor of earth and planetary science and dean of mathematical and physical sciences at UC Berkeley. Interestingly, today's pole and the two ancient poles lie in a straight line equidistant from the planet's biggest feature, the Tharsis rise, a bulge just north of the equator that contains Mars' most recent volcanic vent, Olympus Mons. Tharsis is the largest volcano in the solar system, and formed about 4 billion years ago, not long after solidified. Manga thinks that If a flood of water had filled the Arabia ocean about 3 billion years ago, to a depth some have calculated at up to several kilometers, that mass at the pole might have been enough to shift the pole 50 degrees to the south. Once the water disappeared, the pole could have shifted back, then shifted again by 20 degrees during the deluge that created the Deuteronilus shoreline. Richards is skeptical of this, however, pointing out that thermal convection within the hot interior of could also have caused the poles to wander. "There must certainly be thermal convection in now because Olympus Mons had new lava flows very recently, within the last 100 million years," he said. "But the jury's still out." The work was part of UC Berkeley's Bioproject, funded by NASA's Astrobiology Institute.